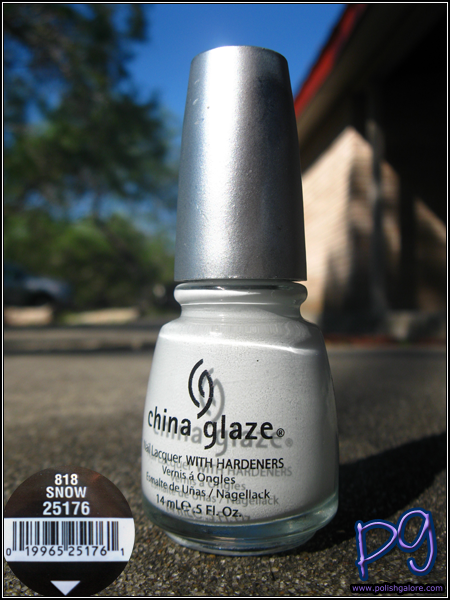 Skipping around a little bit - here is China Glaze Snow from the 2010 Winter Collection. Now if you've been reading my blog for awhile, you'll know I've already swatched China Glaze Snow from the Specialty (also called Glitters and Cremes) collection but more on that later. This is Snow from the 'Tis The Season to be naughty and nice collection. It's listed just simply as a white creme, and frankly that's what it is. I used a base of Seche Natural, 2 coats of Snow and a top of Seche Vite. My Snow was a little on the runny side - not unmanageable but sometime I wish polished had a thickening product - much like they have a thinner. In the sun, Snow is just kind of a squishy white cloud - almost like a marshmellow. I think this would be a great base for a lot of nail art or for use in nail art. I like this, I've just bought China Glaze White on White but not sure what it's going to look like...possibly not much different again!